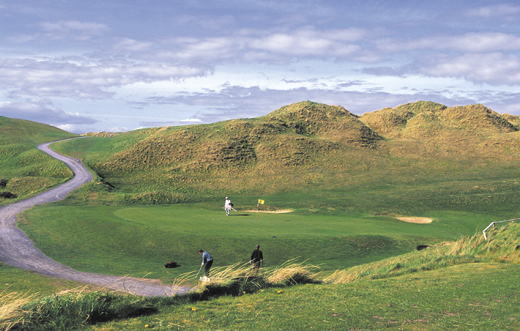 The American love of golf has created a new form of business in Ireland – golf tourism. A mean Atlantic southwesterly howls up the sand dunes, blasting a wintry chill across the grassy headland. Out on the exposed hills a slow procession catches my eye. Leaning into the gale is a hardy knot of Arctic adventurers, pressing on and pausing, driving forward for all their worth. They’re buttoned from head to toe in woolens and waterproofs yet they’re out enjoying themselves, chasing after a small white ball. There’s no doubt golfers are a breed apart. While George Bernard Shaw famously observed that golf is one sure way to spoil a good walk, a growing number of strollers will risk dragging a set of clubs along with them. There has been an upsurge in the number of golf courses in Ireland but aside from local interest, the game’s growing appeal has generated a new form of business — golf tourism. It’s an ambitious target but the figures tell their own story. At present there are about 440 golf courses in Ireland with quite a number of high-profile courses — such as the K-Club, Mount Juliet, Doonbeg, Carton House, Druid’s Glen and Fota Island — developed in recent years. Those who care little for the small ball game might feel we have more than enough courses thank-you-very-much but the demand is such that it’s not so easy getting out to play. Even with so many new courses springing up, the waiting lists for club membership are getting longer, not shorter. Private membership can cost over $20,000 — what’s more, you’d be lucky to get it, especially anywhere within driving range of Dublin. Golfing holidays began to boom in Spain and Portugal while renowned venues in Ireland, Scotland and England lost out. They had something to sell but weren’t willing to sell it or didn’t know how. To their credit however, administrators of the game got together to review the situation and sort out a cohesive marketing plan. They saw how they could accommodate visitors by opening off-peak playing hours to non-members. The income from green tees would defray running costs and visitors got to play. Whether the move was prompted by goodwill or business acumen it has certainly paid off. In a game notoriously unforgiving on close calls, it was a win-win situation. SWING was formed in 1988, incorporating nine clubs — Lahinch, Ballybunion, Waterville, Dromoland, Dooks, Killarney, Shannon, Tralee and Dingle — and pooling resources to cultivate a growing overseas market. Clubs around the country formed similar marketing groups — such as West Coast Links, IGTOA, Green Isle Golf, Shannon Golf Partnership and others — to make their own pitch for business in an increasingly competitive and profitable arena. But there was no point luring tourists if facilities weren’t here for them. At national level Bórd Fáilte’s Operational Program for Tourism (1989) provided £9 million in funds to develop new `pay-and-play’ clubs as well as encourage established clubs to open up for tourists. A second tranche (1994-99) completed the agency’s structural development of golf tourism. The same shift is reflected nationally. Golfers from Britain make up about half of those who come to Ireland to play but the American share has grown to almost 35 percent, many of whom play premium courses. In tourism-speak they are valued as `high-yield guests.’ A high ratio of repeat business suggests the visitors get exactly what they come for. It’s a game where tradition runs deep. Golfers everywhere love to try the famous old courses and in Ireland they go for Royal Dublin (est. 1885), Lahinch, Royal Portrush, Portmarnock, Royal County Down, Old Head of Kinsale, Balmoral and Woodbrook. Of course the newly-built courses can’t compete in terms of history and tradition. To win immediate profile and prestige the current trend is to hire an international golfing figure to design the course. Many of the new courses in Ireland have a famous stamp on them, such as Jack Nicklaus’ design at Mount Juliet, Arnold Palmer’s at the K-Club or Bernhardt Langer’s design of the newer links course at Portmarnock. There are about 151 links courses in the world and one third of them are in Ireland. Not surprisingly, there was huge interest when Australian champion Greg Norman was invited to design the course on coastal farmland at Doonbeg, Co. Clare. The opportunities for building new links courses are obviously diminishing — Doonbeg runs for a sprawling 385 acres — but Norman was over-whelmed by the potential of the site. Designers are known to complete their work after a few visits to a course but Norman’s involvement at Doonbeg, saw him visit the site on an unprecedented 23 occasions. Under strict conservation guidelines to protect the 100-foot dunes in Doonbeg he sought to work around existing features on a `minimum disturbance’ philosophy. The Great White Shark also came up against a most unlikely foe. The site turned out to be a habitat of a rare species of snail, the Vertigo Angustior, so additional directives were issued to protect it. In the wake of the September 11 tragedy there were widespread fears that Americans would not travel in numbers this year. Tourist business in Ireland is certainly down, but golf, it seems, is impervious to everything. “Golfers are war-proof, recession-proof and waterproof,” suggests Paddy O’Looney. If Irish golf tourism remains a quality product offering value for money, he and others are confident that the future is bright.